A, You’re Adorable is an alphabet book with a difference. The words were originally written in 1948 as lyrics for a song which was subtitled The Alphabet Song and appropriately, the text dances and sparkles across the pages as the alphabet of endearments progresses. 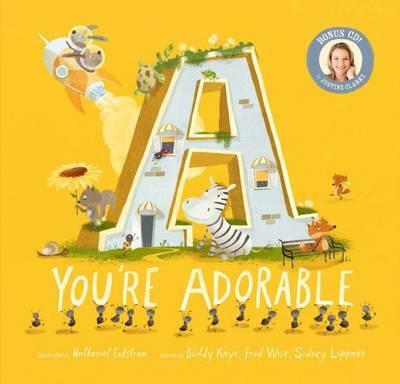 This fun and upbeat picture book is packed full of cute animals as well as plenty to spot for every letter of the alphabet. The illustrations are a mix of charm and cheekiness with many creatures of the land, air and water playfully adoring each other. These pictures have made what could have been an overly saccharine book, simply engaging and delightful. The song on the bonus CD is sung fabulously by the wonderful Justine Clarke, who many children (and their parents) will know from Play School and her own CD’s, Songs to Make You Smile and I Like to Sing. When the two-year-old in my life heard it she said, ‘Again’ each time the song finished. Its catchy tune and easy lyrics make it very easy for adults and young children alike to sing along to.